His first book at Viking was a change of pace, too. King considers The Dead Zone to be science fiction, unlike the fantasy/horror of his previous books. The Stand was meant to be a “summing up” of what he’d done to date, and it was time to move on to something different. He started The Dead Zone in 1976, wanting to write about a high school teacher, a profession he knew a lot about from his years at the Hampden Academy. His first attempt at the book focused on a child killer in a small town. He conceived of a scene where the teacher is giving an exam. When he touches the hand of one of his students when she’s turning her paper in, he has a vision that her house is on fire. The house may have been on fire, but the book wasn’t. After finishing The Stand, he went through a period where several books didn’t work out. He abandoned two novels, Welcome to Clearwater and The Corner, and his first cut at The Dead Zone didn’t pan out, either. He put it aside and started Firestarter, but went back to The Dead Zone when he thought he was just reworking Carrie. He was desperate to finish something—anything—and depressed that he might already be imitating himself. He did complete a couple of short stories during this period, notably “One for the Road” and “Children of the Corn,” and finally finished the first draft of The Dead Zone in 1977 before moving to England. When King was around four years old, he was hit by a hockey player and knocked out for several minutes. It’s one of his earliest memories and became the foundation for the book’s prologue. Peter Hurkos, who is mentioned in the novel, reportedly acquired psychic abilities after falling from a ladder. King wanted to talk about a man who becomes a social pariah through no fault of his own—it all came down to coincidence and bad luck. Johnny Smith had been on a remarkable run of good luck at the fair (just as King had been in publishing) but it was all taken away from him later that evening. Johnny’s ability to envision the future allows him to see through unstable, power-hungry politician Greg Stillson’s lies—but on the other hand, a lot of violent and paranoid men claim they can see the future. King wanted him to be decent without being “a plaster saint,” and he wanted Stillson (derived from “still” + Nixon, according to Doug Winter) to be genuinely nasty but plausible and persuasive. King recently said he based Stillson on Huey Long. “Every now and again in America one of these guys shows up—a so-called ‘friend of the common man.’” Making simple, charming everyman Johnny Smith interesting was difficult—it’s always easier to make the villain vivid. King wanted to explore whether a political assassination could ever be the right thing to do, and whether he could make the assassin the hero of a book. The political assassin has been a boogeyman since the JFK killing, King said. It was going to take some work to get readers aligned with his protagonist. He admits that he copped out a bit at the end because he didn’t want a “justified” assassination to become an excuse for future, real-life political malcontents. King also wanted to talk about the just-ended decade—the novel starts in 1970 and ends around the time of the Jonestown massacre of 1978. By putting Johnny in a coma, he was able to review the seventies like a news reel. When he wakes up, Johnny needs to acquaint himself with the changes, including who died while he was asleep, something King had to research. One of the novel’s touchpoints is the Washington Irving short story “The Legend of Sleepy Hollow” about the plight of a schoolmaster named Ichabod Crane, which Johnny reads to his class, but the real inspiration here was “Rip Van Winkle,” who slept through the hardships of the American Revolution and awoke to a much-changed world. The Dead Zone, published in August 1979 with a first printing in the 50-80,000 copy range, spent more than six months on the NY Times bestseller list (where it also received a glowing review) and reportedly sold 175,000 hardcover copies in the first year. It was supported by King’s first major book tour, somewhere between seven and twelve cities (accounts vary). King was also happy with the book’s production compared to his recent experiences with Doubleday: a nice cloth binding and an attractive dust jacket. 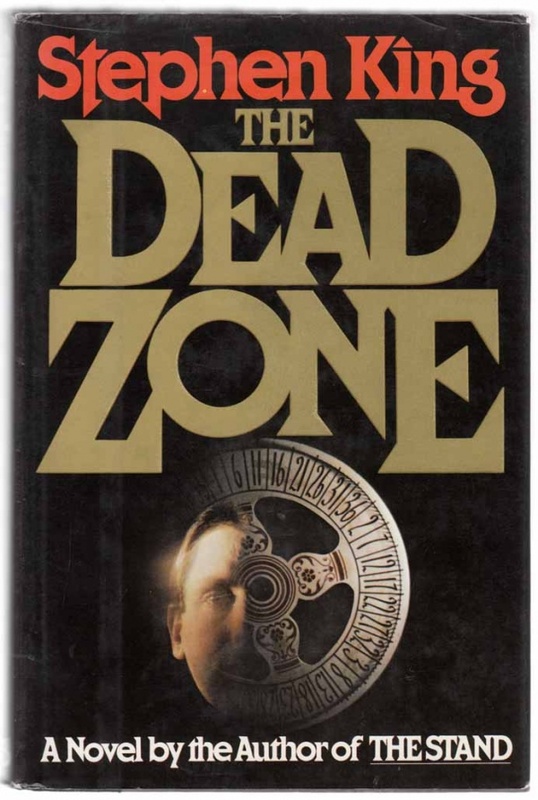 The Dead Zone is also the first novel to acknowledge the Stephen King Universe and is the launching point for the connections that will become integral to his future works. Someone accuses Johnny of starting the high school fire with his mind “like that girl in Carrie.” A couple of books later, in Cujo, also set in Castle Rock, events from The Dead Zone will be mentioned. It also features a rare appearance by a historical figure in a cameo role, President Jimmy Carter. Although this anecdote has featured different novels, including The Stand, one variant says that it was the manuscript of The Dead Zone that King temporarily lost at an airport. According to a feature in USA Weekend, he ended up with another passenger’s suitcase, which contained pineapples. After his final appearance in Cleveland, King was joined on his flight back to Bangor by a man in full Ronald McDonald clown regalia, an encounter that would prove inspirational in a future novel. Castle Rock started out as a fictionalized version of the Norway-South Paris region of Maine but eventually turned into its own place. The name is probably derived from a rocky outcropping on the island in William Golding’s Lord of the Flies. As well as appearances by a couple of real network news correspondents from the era. Thank you, Bev. It was a fantastic article. I learned things from it that I didn’t know, which made it even more of a pleasure to read. Why is The Dead Zone the only King novel not released on audio CD? Fascinating! A lot of great stuff there I haven’t read before. More often then not Steves’ stories seem so perfectly effortless and brilliant (even tho he is pretty open about his real life struggles), its nice to see that he is indeed human and faces many of the same challenges that we all do. He is a true Living Legend! Great essay, Bev, Thank You! Thank you for a great read . I learned several new things . I have always had a special place in my heart for this book. Thanks for the reminder, Bev. I love this book. It’s the one that cemented as being a Faithful Reader. Thanks for framing how the book came to be. Thanks for the insight, Bev! I could never put my finger on WHY I loved Dead Zone so much…now I can. I re-read this a couple of weeks ago, having first read it in the late 80s. As I’ve found several times during this re-reading exercise, I was suprised by how little supernatural “stuff” there was in the book. Whatever King’s faults, his characterisation is almost peerless. So it was with The Dead Zone. A little dated in places, I as you might expect, but still enjoyable. Oddly, I started to watch the movie last night for the first time in a long long time. Yikes! Big mistake. It was awful. Worse than a 70s TV movie. Fell asleep after half and hour. Woke up intermittently during the rest of the movie but quickly fell asleep again. Iian, not everbody thinks The Dead Zone with Christopher Walken is a bad movie. It’s actually been considered one of the best film adaptations of a Stephen King novel by many critics and viewers. I know I certainly enjoy watching it and try to do so at least once every year. I’m sorry you didn’t find it as appealing. Yep. Me too. Love the movie version. ‘The ice is gonna break!’ moment gives me chills everytime. Hmmm… I loved the movie with Christopher Walken. One of his best, actually. I’m always surprised when an adaptation of a King book works out. The Dead Zone worked out VERY WELL, in my humble opinion! Very well put, Bev. Thanks for the info. THE DEAD ZONE was a great book. From a screen sense, this was the first time I felt Christopher Walken actually threw himself into a real character role…I think he really loved the book and wanted to stretch himself as an actor. Hey it’s better than that ping pong movie. Great Job! It was a pleasure meeting you in NEW YORK! I wish i had more time to talk to you! I have all your books about SK and need them signed by YOU! Good to meet you, too!